You might have bought a dress on its website, or paged longingly through its catalog, or rifled through its quirky offerings in store—but there’s probably still a lot you don’t know about Anthropologie. 1. ITS PARENT COMPANY IS URBAN OUTFITTERS. In 1971, Wick and Hayne got divorced, and Belair graduated from Wharton and moved on to a Wall Street career, leaving the Free People's Shop behind. But Hayne stayed with the business, and in 1975, he relocated to a bigger space and changed the store's name to Urban Outfitters, partially in response to the end of the Vietnam War. “[The war] had been incredibly divisive, and there was just this amazing change of mood,” he told Philadelphia Weekly. “The name ‘Free People’ had some political connotations, and they were growing tired ... It happened to be the time when we were just putting together the deal to move to a much larger space and felt that, in conjunction with that, we should change our name.” Later, Hayne would bring back Free People, and create Anthropologie, under the Urban Outfitters, Inc. umbrella. 2. THE NAME IS A SPIN ON HAYNE’S COLLEGE MAJOR. Hayne graduated from Lehigh University in 1969 with a degree in anthropology. The store is named after the discipline and translated into French. 3. IT STARTED AS A LINE THAT URBAN OUTFITTERS SOLD WHOLESALE TO SPECIALTY AND DEPARTMENT STORES. The Anthropologie line debuted in 1991, and, according to a Women’s Wear Daily article from that year, had “chiffon looks” for its first offerings and “solid and printed lambswool sweaters, miniskirts and leggings” for the fall and holiday seasons. 4. HAYNE AND AN INTERIOR DESIGNER SPENT TWO YEARS CONCEPTUALIZING THE STORE BEFORE OPENING IT. 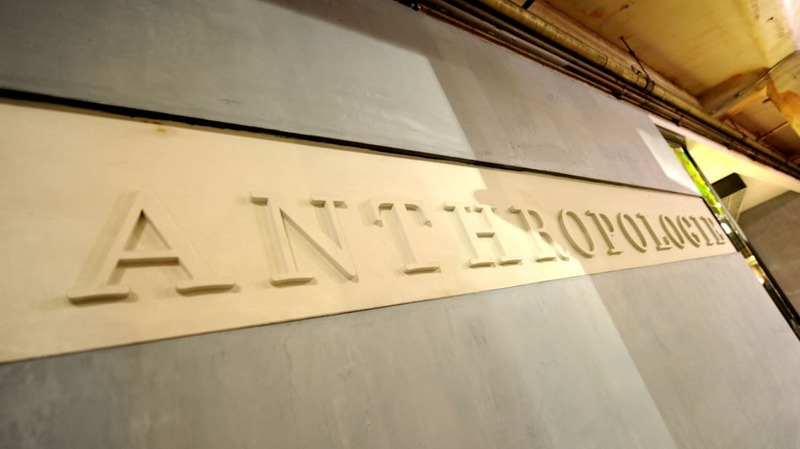 The first Anthropologie store opened in Wayne, Penn., in 1992, in a terra-cotta building that had been a car dealership. 6. … BUT IT DOES SEND OUT CATALOGS. 7. THE COMPANY BRIEFLY SOLD MEN’S CLOTHES. 8. CHARLES DICKENS’S GREAT-GRANDDAUGHTER WORKED THERE. Polly Dickens was the director of the home division from 2000 to 2003. 9. JULIA ROBERTS IS A STAND-IN FOR THEIR IDEAL CUSTOMER. On a demographic level, Anthropologie shoppers are typically 30 to 45 years old, have college or graduate degrees, are in a relationship, and have an annual household income of $150,000 to $200,000. But the employees describe her in other, more personal ways. Then-president Senk told Fast Company in 2002 that he preferred to describe Anthropologie’s customer in “psychographic terms,” which are all about attitude and lifestyle: “She's well-read and well-traveled,” he said. “She is very aware—she gets our references ... She's urban minded. She's into cooking, gardening, and wine. She has a natural curiosity about the world. She's relatively fit.” Fast Company says Julia Roberts—a frequent shopper—is the “celebrity avatar of Anthropologie,” noting that her wardrobe for The Mexican came from the store. 10. EACH STORE IS DESIGNED TO HAVE A UNIQUE FEEL—BUT THERE IS CONTINUITY. But there’s at least one element that might not be found in most private homes: Each store’s furniture and racks are also laid out on a grid, aligning at 35-to-40 degree angles to create symmetry. 11. EACH STORE HAS ITS OWN DESIGN TEAM THAT FOLLOWS AESTHETIC PROMPTS FROM CORPORATE. Though the size of the design team depends on the time of year and the size of the store, each includes a display coordinator, who brainstorms and constructs both the window and store displays, and a visual coordinator, who merchandises the displays when they’re done. Many of Anthropologie’s displays are handmade and created with found materials. The budget for the windows is as little as $5000. 12. ITS COLLECTIONS ARE BASED ON, AND BUILT AROUND, THREE IMAGINARY WOMEN. Using the women’s narratives—which will include things like where she went to school and what books she likes to read—and interpreting aesthetic concepts like “she likes to play with color” and “her clothes have a lot of asymmetry” not only helps to create a cohesive narrative from store to store but also lets each individual store’s design team be creative. 13. SOME OF THE DISPLAYS ARE AUCTIONED OFF, WITH PROCEEDS GOING TO CHARITY. The windows change every 6 to 8 weeks, and the interior displays are rotated more often than that. When a display’s time is up, it either goes into storage to be used again or is auctioned off for charity. For example, when butterflies created for the Greenville, N.C. store’s Earth Day celebration were sold, proceeds went to American Forests and were used to plant new trees. 14. ITS FORMER BUYER-AT-LARGE HAD A REALITY SHOW. The Sundance Channel’s Man Shops Globe followed Keith Johnson as he traveled the world looking for one-of-a-kind items to furnish and sell in stores, and objects that could be used to inspire collections. (He traveled so much that his passport had 72 extra pages.) Johnston told Fast Company that, beyond quality, the perfect Anthropologie find “has to have a lot of personality. It has to be homey. Maybe it has a sense of humor. It has to have a little quirk. People respond to fun—a little whimsy goes a long way.” Man Shops Globe ran for two seasons. According to Racked, in 2014, “Anthropologie's North American net sales accounted for approximately 39 percent of the brand's consolidated net sales, which were just over $3 billion.” Its revenue per square foot is off the charts: The brand brings in $995 per square foot, compared to $696 for Urban Outfitters stores. 16. … AND ITS CUSTOMERS SPEND A LONG TIME SHOPPING. In 2015, Anthropologie customers spent an average of 75 minutes shopping in stores. 17. ONLY NINE STATES DON’T HAVE AN ANTHROPOLOGIE STORE. They are: Alaska, Iowa, Montana, New Hampshire, North Dakota, South Dakota, Vermont, West Virginia, and Wyoming. Soon, that number will shrink to eight; Anthropologie will open a store in West Des Moines, Iowa, in 2016. The store is also international: There are 12 in Canada, nine in the UK, and one in France. 18. THE COMPANY HAS A GARDENING STORE AND A WEDDING STORE. Terrain was launched in 2008, and BHLDN—pronounced “beholden”—in 2011.